Long before Volkswagen started advertising the Beetle's ability to float, they built a vehicle meant to swim. It was called the Schwimmwagen or Type 166 for those who speak Volkswagen. Most of the approximately 16,000 amphibious Schwimmwagens built by Porsche and Volkswagen in the 1940s were destroyed in WWII, making this example currently on Ebay very rare and accordingly very expensive. Germany's amphibious vehicle during World War II came in the form of the Schwimmwagen seen here. 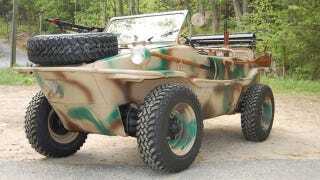 Designed with a high body, drop down rear drive propeller, and full time four wheel drive the Schwimmwagen was built to be able to capable tackle any terrain or body of water it might encounter during battle. Powered by an 1100cc flat four, it may have been expected to go everywhere, but it certainly wasn't going to do it quickly. "This example was found hidden away in the mountains of France near Switzerland probably left there by the retreating German army, it had been owned by the same person since the early 1950's, it was purchased in the early part of the last decade brought to the US by a collector who had previously owned one and totally restored to be as correct as possible." Usually a vehicle's value is directly tied to how rare it is and the Schwimmwagen is no exception. The buy-it-now price on this Volkswagen is a whopping $185,000, virtually unheard of territory for any air cooled Volkswagen (outside of Barrett-Jackson). For that price you don't even get the pictured deactivated rifles, a fact the seller spells out very clearly multiple times in the auction listing. Although this Schwimmwagen is interesting, it's high price and dark history mean we'd probably spend our non existent 185K elsewhere if we were in search of a car to take for a swim.